Opening tonight at Dream Bags and Jaguar Shoes on Kingland Road, a new exhibition entitled PAPRECUTS. 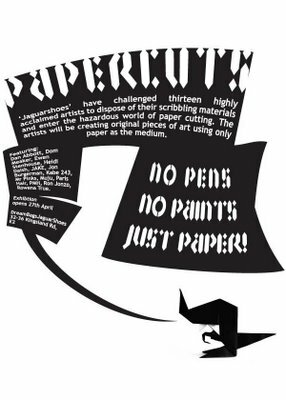 A selection of artist and illustrators were challenged by Jaguar shoes to dispose of their scribbling materials and enter the hazardous world of paper cutting. The artists will be creating original pieces of art using only paper as the medium.